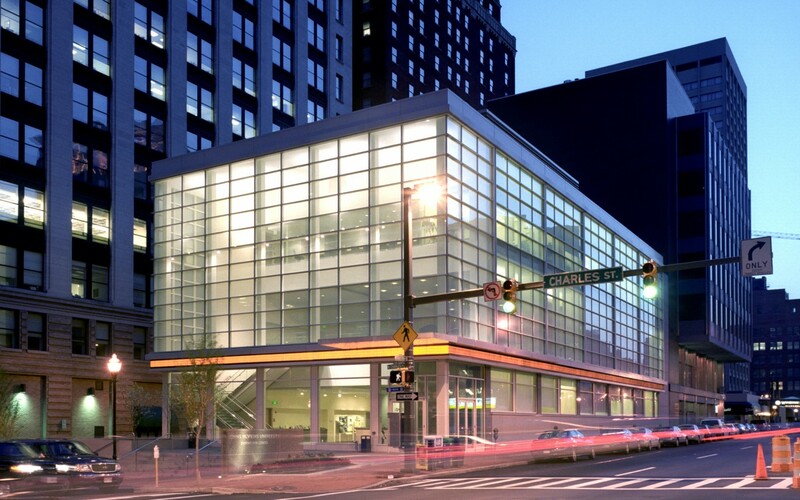 Johns Hopkins University’s long-awaited consolidation and relocation of its Graduate Division of Business and Management programs on a prominent site in the heart of a city’s downtown presented the challenge of imaginatively adapting, reusing and adding to an abandoned clothing store built in 1963. The school’s former facility occupied the upper floors of a mixed use complex which was ubiquitously clad in a dark brown brick. The complex was pushed back from the street edge, and was often in the shadow of adjacent high-rise apartment towers. Its entrance was blurred among the various entries of the complex. The program and budget limited the project to approximately 37,000 gsf. The key was to instill this relatively small structure with a strength and energy that could hold up well within the context of its more substantial neighbors, particularly the Mies building across the street. Central to the design is the use of light, proportion, and expressed structure. 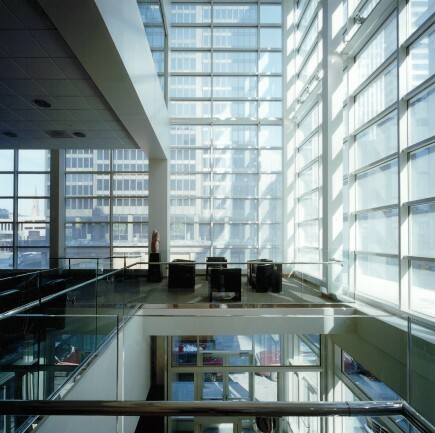 Laminated patterned glass on the upper floors diffuses light to act as a lantern above an electronic sign board and large sheets of clear glass with granite panels at the lower level. 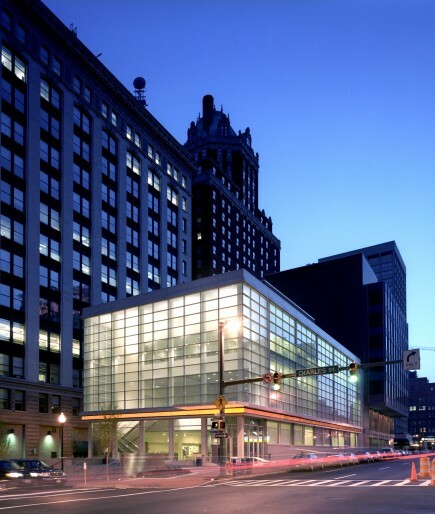 The concept was to provide a somewhat scaleless sculptural beacon that serves as an icon for the university and is a respectful addition to its downtown neighbors. As a result, the new building has transformed the school’s image in downtown into a welcoming, transparent, and light filled presence. 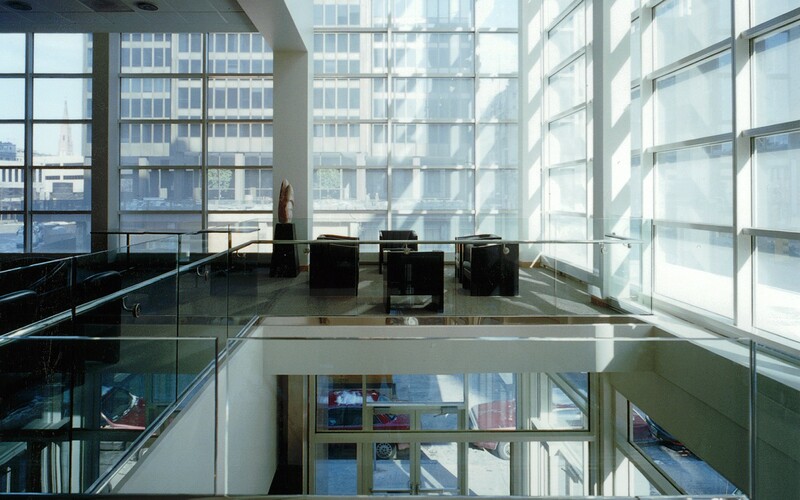 The entrance to the building is clearly marked by a dramatic, full height atrium lobby that fronts the street edge. High-tech classrooms, MBA case rooms, and computer labs provide students with an up-to-date learning environment, comparable to the nation’s leading business schools. The electronic sign board displays the city’s local news, as well as national and international business headlines.